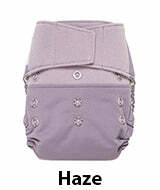 GroVia Shell is a hybrid diaper cover that has snaps inside to hold the snap-in soaker pad which is sold separately. Hook and loop version. This is the SOFTEST loop on the market. The front panel is the loop part and it is soft and pliable. The hook (on the wings) is firm hook which it needs to be to grab into the loop to stay fastened, but the front of the cover, the loop part, is soft and pliable making it nice and comfy for baby's tummy. I, Karen, like this the best of all the hook and loop versions. The part you fasten it to isn't just a strip across so you can fasten it anywhere in the front for a custom fit. Nice design! It also adjusts down for a very young baby quite well, unlike other one-size fits most options. Does not have leg gussets. 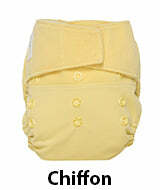 GroVia Shell is a hybrid diaper cover that has snaps inside for the snap-in soaker pad (sold separately). The Shell is designed to allow for multiple wears between washes and uses the industry's best materials. For use with GroVia Soaker Pads, GroVia BioSoakers, and other absorbent diapers. GroVia calls it a "shell" but the common word is "diaper cover" - they mean the same thing - the waterproof part that goes over something absorbent. The special thing about this is that it has snaps inside it. It is designed specifically for use with the GroVia Organic Cotton Soaker Pads which are sold separately. You can use anything that fits in there that is absorbent (and ignore the interior snaps) such as a prefold. They are very trim fitting, so the small yellow edge prefold is usually the correct size inside this trim cover at the highest rise. Choose newborn orange edge for smaller rise settings. If you want trim, this is it. Of course, the trimmer it is, the smaller it is, which means it is not going to be as absorbent as a big and bulky diaper, but that is always the trade-off. The best use is of course with the soakers that are specifically designed for it. 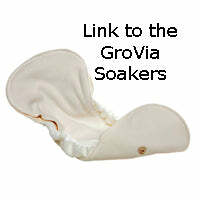 Organic Cotton Soaker Pads) The GroVia Soaker Pads in the GroVia Shells make a very trim, very easy to use system. 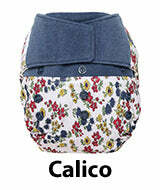 The shell is made of 100% polyester with TPU waterproof layer with a polyester inner mesh layer. Made in China. Note from Karen: This is trim and it can be used over prefolds by ignoring the inner snaps that are there to attach the snap-in soakers. I find that the small yellow edge prefolds work nicely on the the highest rise setting. The medium prefolds are a big too much for this trim cover in my opinion. The hook and loop version is the softest, most gentle hook and loop system available. It's not likely to bind baby's tummy like stiffer, scratchier version of hook and loop. If you care for it gently it will last just fine but if you wash it harshly, that will take a toll on the hook and loop closure over time. There is always a tradeoff for softness. Snaps in all brands are always more durable than hook and loop style closures but still there are advantages and disadvantages of each style and it's great to have choices. I like soft and comfy, so I do like this hook and loop style better than the stiffer kind. Shell and snap-in soaker sold separately. Link to GroVia Shell Snap version. So far, very good and the brand I prefer. I am new to cloth diapering and so I ordered covers from a few different brands. So far, I really like using these and prefer them over the Flip and Thirsties covers. I don’t find them to be trim at all, though. My baby is long and lean and only six weeks, but these are very bulky on her. Still, they are so well made. They don’t leak no matter how imperfectly I’ve wrapped her diaper, the colors are beautiful and they wash well. I imagine the Velcro won’t last forever, which is a shame because I prefer these over snaps. These are truly nice diaper covers. But they are far from “trim”. They’re incredibly bulky on my newborn daughter regardless of the diaper I use (flats, prefolds, or soaker pads). She isn’t comfortable doing in them. Granted, she’s light and very thin, but I still didn’t think they’d be swallowing her. Thinking of saving these and doing cloth when she’s a little older and bigger and just going the compostable disposable route for now. GroVia is worth every penny. On the lowest rise it fits my 10 pound infant. And has room to grow! I love these covers. They are so soft and stretchy and have a higher cut leg. I started using them with my baby when he was around 7 months, so I'm not sure how they'd fit on a younger baby, but the fit is great for us now. LO is 8 months, around 18 lbs, on the slim side. He's not a heavy wetter, so I like that these are trim. They work well with a padfolded small prefold or a flat. (I've even fit a medium padfolded prefold, although obviously it's a bit bulkier.) I don't love the mesh inside, since you can't just wipe the inside down, but it's not a deal breaker for me. Love the print and easy to use! Super cute print [Polar Pool Party] and easy to use!